With a life long love for sweet treats, and a pastry chef for a mom, it always seemed like an obvious choice that Sarah would follow in her mother's footsteps. 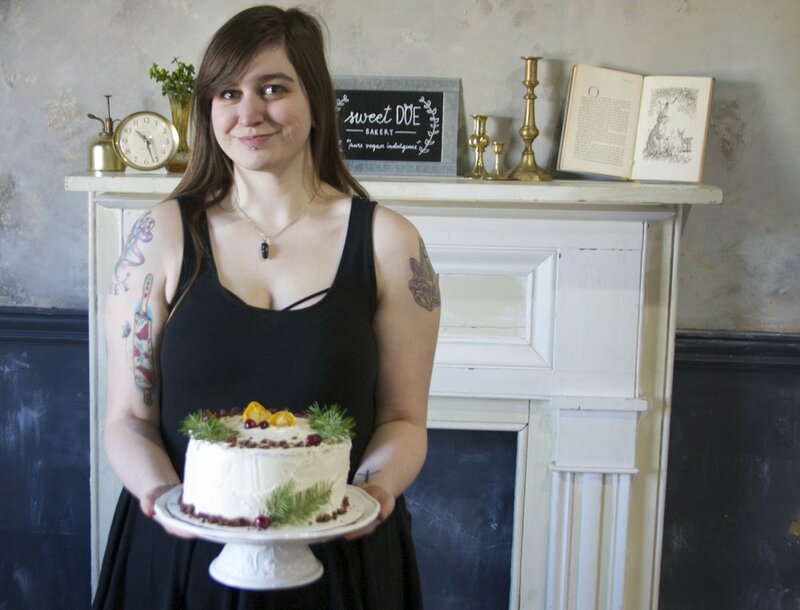 After dropping out of college, and unsure what to do with her life, she started baking vegan cupcakes for local DIY events. After an overwhelming positive response, she began to experiment with more recipes. Even taking some of her mom's beloved recipes and making them vegan friendly. What originally started as a hobby to make some extra cash started to steadily grow into frequent custom orders, more events, and eventually a business with a name. With a love for unique flavor and a strong desire to create, every recipe was tried and tested, some even taking years to get right. Everything is made by hand, and it shows through the small imperfections in every individual treat. The business is built on the belief that you can always taste when something is made with good ingredients, and made with love. Sweet Doe Bakery is a combination of a love for sweets, a respect for all living things, rustic charm, and a child-like whimsy. Sweet Doe Bakery has many friends and supporters in and around the Lehigh Valley. We've been fortunate enough to have some great some write ups in local media. Fresh at Lehigh Valley farmers markets: Vegan doughnuts.